Snippets of Jack: "I really rather hoped that we were past all this." "I really rather hoped that we were past all this." 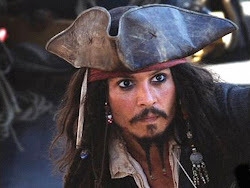 Jack Sparrow: When you marooned me on that god forsaken spit of land, you forgot one very important thing, mate: I'm Captain Jack Sparrow. A long time ago; the crew of the Black Pearl was a greedy lot, always on the hunt for a bigger and better treasure then what they already had. after searching for sometime they stumbled upon the cursed gold of the ancient Aztecs; after marooning Jack on an island; being the idiots that they are; the crew spent all the gold. Of course they didn't know it was cursed. but they sure found out fast. Said curse made them immortal and had several other side effects; Barbossa: For too long I've been parched of thirst and unable to quench it. Too long I've been starving to death and haven't died. I feel nothing. Not the wind on my face nor the spray of the sea. Nor the warmth of a woman's flesh. 10 years later; Jack finds Captain Barbossa hatches a plan. An epic battle took place that day between Hector Barbossa and Captain Jack Sparrow; One that involved fighting, bombs, apples and many other villain type things. Barbossa and Jack lock swords in a duel that could end in only one thing; death. Barbossa: You can't beat me, Jack!